Daniel was my first and probably only guest during my time here in Dresden. I was so happy to be able to share my new (is it new anymore?) life with someone, and I’m happy that someone was Daniel because we had such a blast during the 5 days he was here! 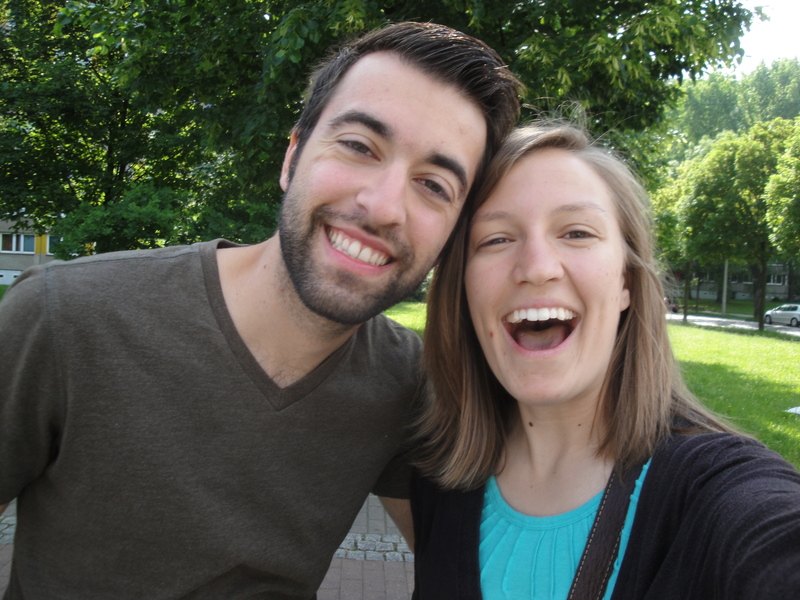 This is real life–a picture with my boyfriend on my actual street! haha. The first thing we did on Sunday was attend evening Mass at the cathedral, kicking off the list of “I’m so glad I can show this to someone” places! 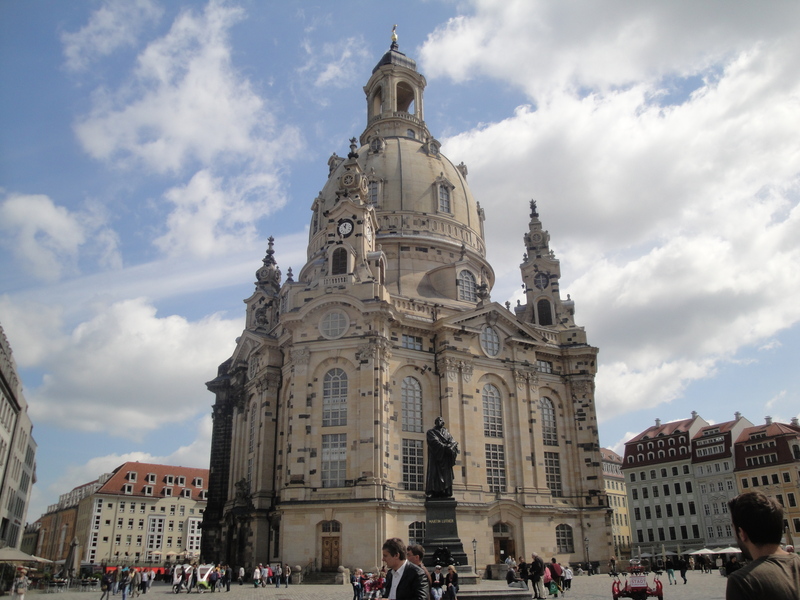 I love going to the Dresden cathedral every week. I think it’s gorgeous. We actually ran into several friends of mine there (which made me look incredibly popular, when in reality that never happens!). Afterwards, we headed up to Neustadt, the hipper part of town north of the river, to get Indian food. There was a great Indian place near town hall that I used to go to embarrassingly frequently before it unexpectedly closed in December, but they have another location up there that I hadn’t been to yet! 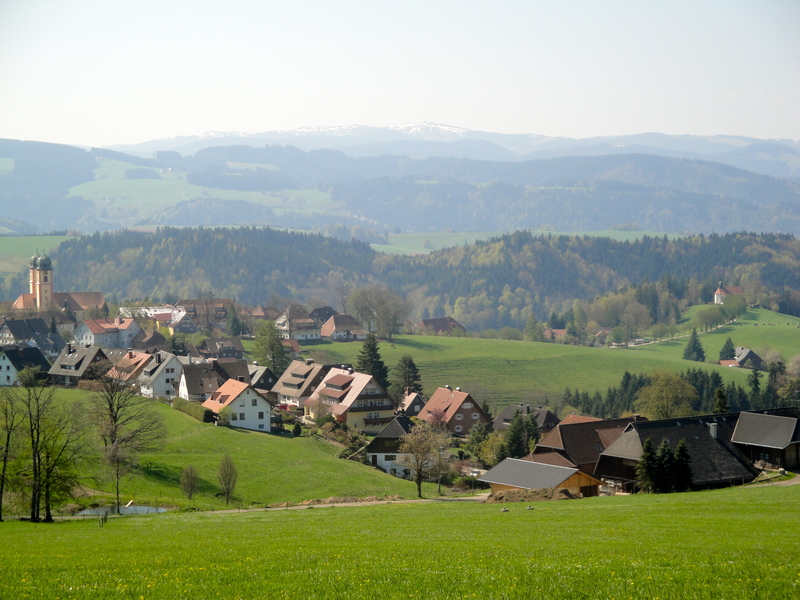 It was also a great chance to see Neustadt at a glance. It was really fun to show Daniel the beautiful city and also I loved having a reason to be a total tourist, taking photos and everything! 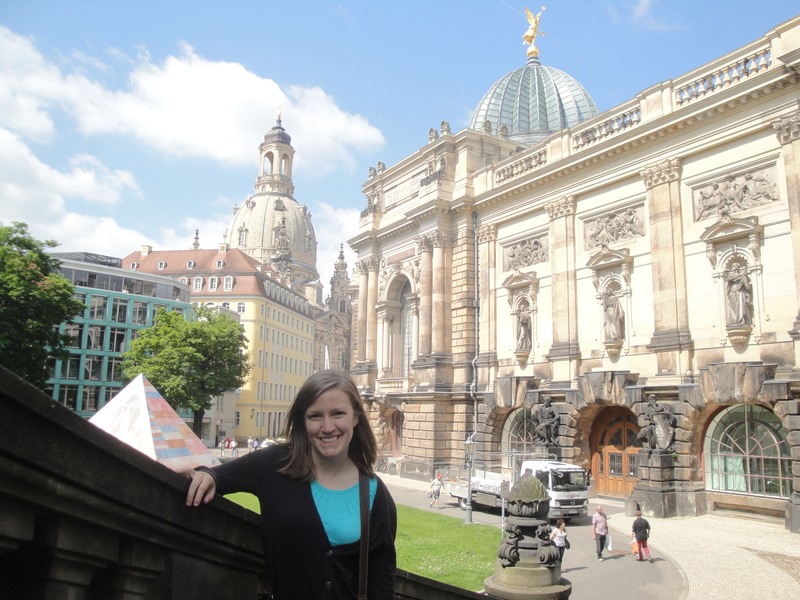 We also had a beautiful day, and I don’t think many of my Dresden-Altstadt photos have had a blue sky so far, so that was great. Then we took the Straßenbahn a few stops to the Weisse Gasse, a kind of expensive but very… varied group of restaurants, and helped ourselves to Cuban tapas! And ice cream. I had a Spaghettieis in honor of German immersion, of course. During the day on Monday, my camera died, so I don’t have any pictures from the rest of the week! Daniel has them, and he is having problems uploading them for some reason… so I’ll just talk about what we did Tuesday-Friday with hopes of later posting the highlights of the photos. On Tuesday, I took Daniel on a little tour around the university and then we had some coffee and cake at one of the cafés on campus before my class at 1. After my class, we took the Straßenbahn about half an hour north to Bühlau, near where I lived with my host family, to see the castles along the Elbe and go hiking in the Dresden Heath. Neither of us had really been hiking since our Colorado trip, so it was fun to have a little urban wilderness excursion. 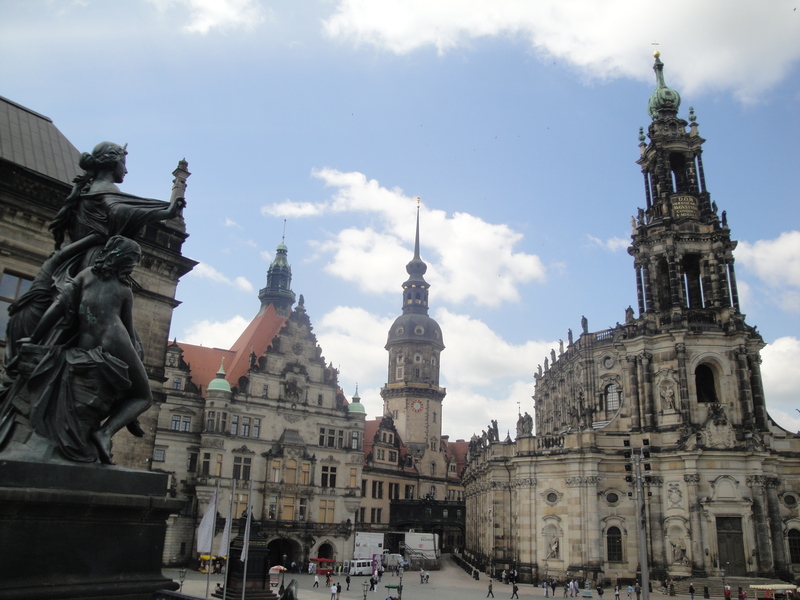 We followed that up with beer and grilled meat at the Biergarten of one of the castles, of course, while enjoying one of the best views of Dresden. 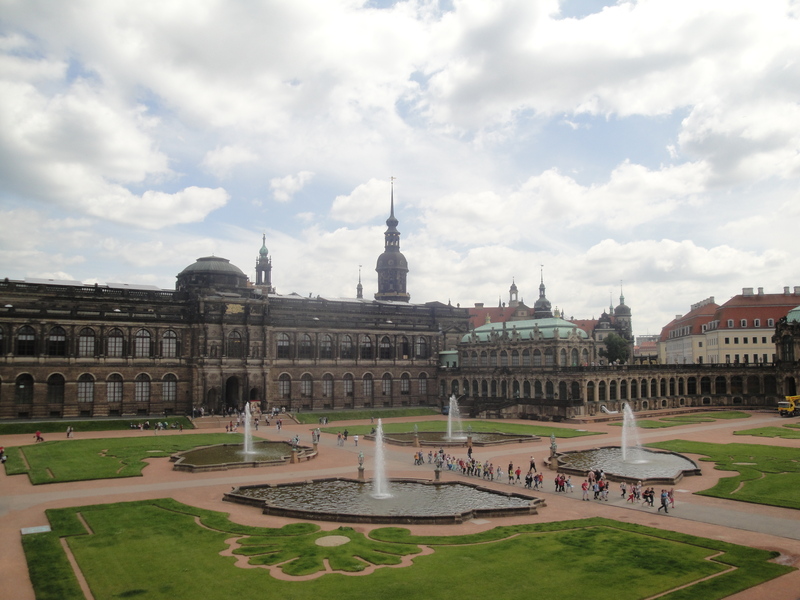 On our way back, we met Felicitas for ice cream– but none of us ended up being hungry, so instead we went to the Großer Garten, Dresden’s biggest park, for a little walk (and a look at another castle in the middle of the park). We actually started Wednesday off at the Großer Garten as well, with a lovely lunch picnic! It was a nice, leisurely change of pace compared to the previous two days! We watched the park train go by, had spinning contests, and successfully opened a beer bottle sans bottle opener. We had picked the park as our chill-out picnic location because it is right next to the Volkswagen Gläserne Manufaktur (“transparent factory”), a state-of-the-art factory where VW’s only luxury car is manufactured. Every single VW Phaeton in the world (not sold in the US) is assembled there! My friend and tandem partner has an internship there so she gave me all the information about English tours, and it was actually really interesting! The idea of the factory is to involve customers in the manufacturing process, as everything about the Phaetons (and Bentleys) produced there is entirely customized. It is absolutely fascinating (and FANCY), even for two non-“car people” such as ourselves. This video explains it way better than I could on this little Cliffs Notes version of our week. Thursday, our last full day together, was probably one of the most fun! After my morning class, we rented bikes for the day and went riding along the river. The weather was gorgeous and I love being able to see the city from a new vantage point. On our way “out of town” along the bike path, we saw the famous Canaletto View of the town which was immortalized in many paintings in the 18th century. We rode about 5 kilometers east along the Elbe before stopping to take a little break, watch some people flying kites, and enjoy some brews at a Biergarten before heading back the other way. Our westward destination was the Pfund Molkerei, the so-called “most beautiful dairy in the world.” Basically, it is a dairy shop that sells cheese and other milk products (and a lot of souvenirs because it’s become a tourist destination), but inside it is absolutely beautiful, decked out with painted tiles from floor to ceiling. No photos are allowed, but Daniel was able to get one… I’ll share it when possible! There is a restaurant upstairs, and we each had a milkshake and we shared a piece of quark cake (like cheesecake but made with quark, a dairy product that I’ve never seen in the States). We passed the cathedral as we biked back through town to the bike rental, and I realized that Thursday adoration was going on! So we stopped by for about half an hour before returning our bikes. That evening, we had dinner at a German restaurant that I actually really liked, despite my German food fatigue. Thanks again, TripAdvisor! I was craving a salad, but Daniel really won with a heaping plate of pork smothered in onions and fried potatoes. And, because we were living large on our last night together… ice cream for dessert! Daniel’s bus to Berlin left a little before noon, so we had time to have a nice breakfast together at one of my favorite cafés near campus. Of course I wish he could have stayed longer, but I had such a fabulous week with him and I’m so glad he was able to visit me in my German home. All things considered, this year has worked out wonderfully for us… better than I could have hoped! We have made so many amazing memories together all throughout Europe. 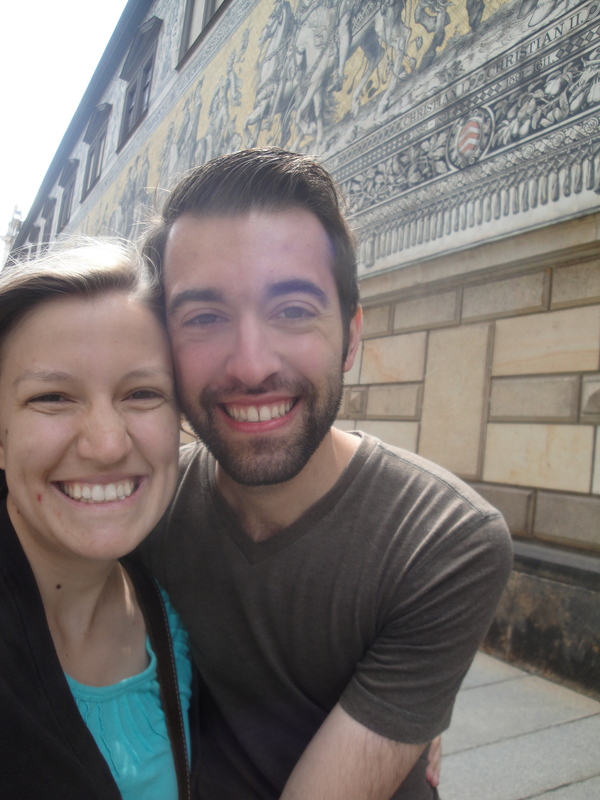 We did lots of really fun things while Daniel was in Dresden, but honestly a lot of the best moments were the uneventful ones: making pizza at my apartment and watching 30 Rock episodes while drinking cheap whiskey… or trying to teach him to pronounce German words! It was just the most fun week ever and I’m so glad to have those memories. Pictures of the rest of the week to come soon, I hope! Let me begin by telling you a bit about myself. I fancy myself to be a pretty good writer. I am a perfectionist and a romantic, especially when it comes to writing. I am additionally quite verbose, if you haven’t noticed. I rarely save documents on my computer. You may be wondering what these things have in common. It doesn’t seem like they fit together, but believe you me, they do. 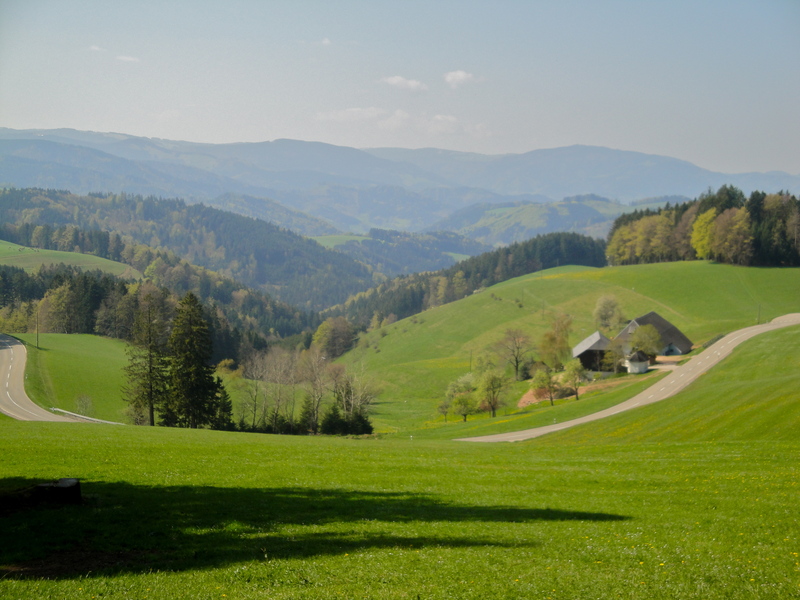 See, I went on a grand Schwarzwald adventure last weekend, and I wanted to write an awesome post telling you about my experience and what I did and what I learned. So I did! It was awesome, trust me. I interspersed pictures throughout, told you about my day on Sunday (which, in case you were wondering, included a museum with cuckoo clocks and regional art, a 10-km hike with one of the most beautiful views of my life, and a pretty church), connected some past life experiences to my Schwarzwald story, and then wrapped the whole thing up with a grand realization I made about Divine Providence. I was really proud of it. I couldn’t wait to post it, but I had to, because, you see, the Internet company has taken forever to get me connected. As I told you, I rarely save documents on my computer, and if you have ever borrowed my computer and been horrified at how many windows I keep open at once, you can imagine that it gets a little overwhelming and confusing. This is the part of the story where tragedy strikes. Between the completion of the brilliant post and my next Internet trip to McDonalds, my computer decided to shut itself down. And delete my beautiful writing. Undeterred, I sat down again and reproduced my original post, rather accurately, from memory. And then my computer died again. And so I gave up. So instead, here are some pictures from my day on Sunday. 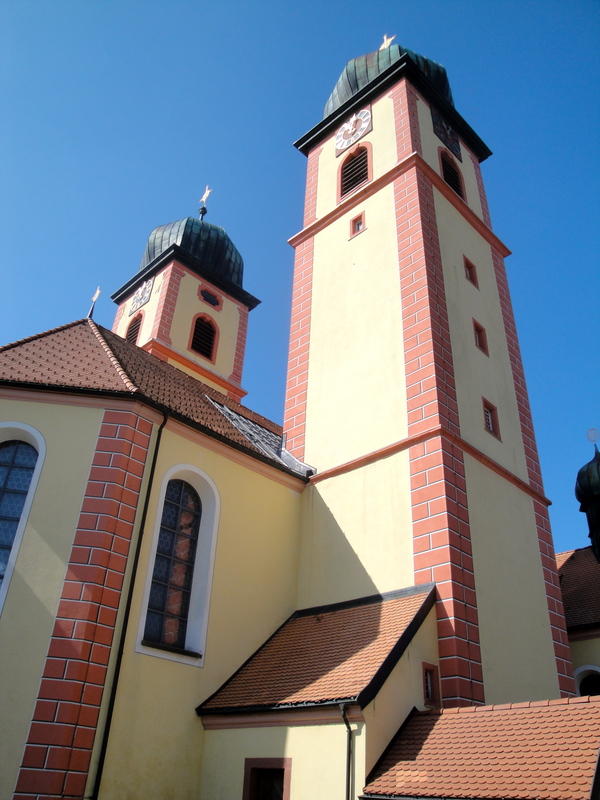 First, I took a train and a bus to St. Märgen, a small provincial town built around and named after this monastery. The monastery is now partially a museum. 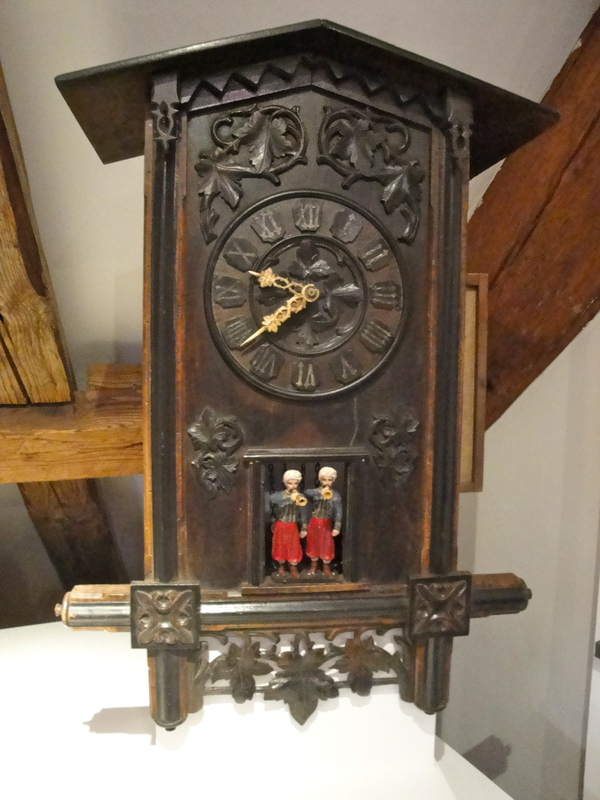 They have lots of cuckoo clocks there, because the cuckoo clock is native to this area of the Schwarzwald. Here’s one. 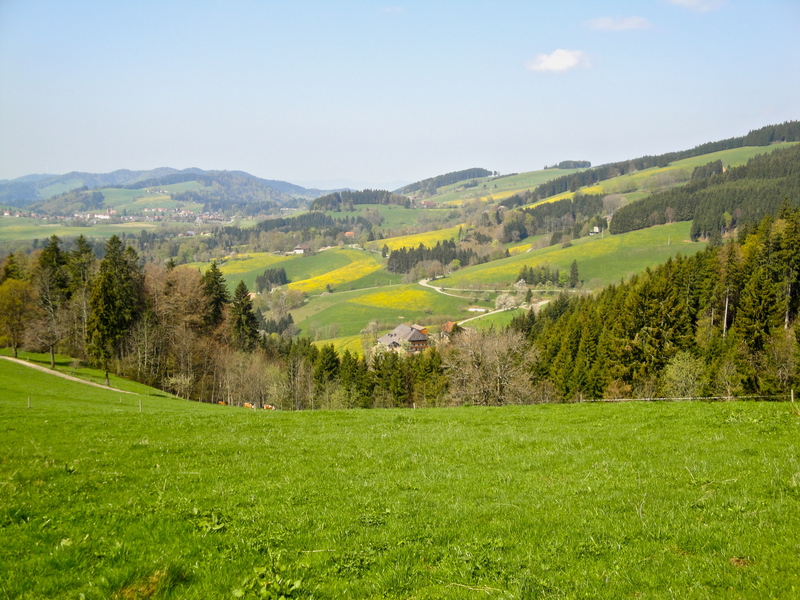 After I got bored of looking at cuckoo clocks, I headed out on the Panoramaweg, a trail through the forest and the hills. 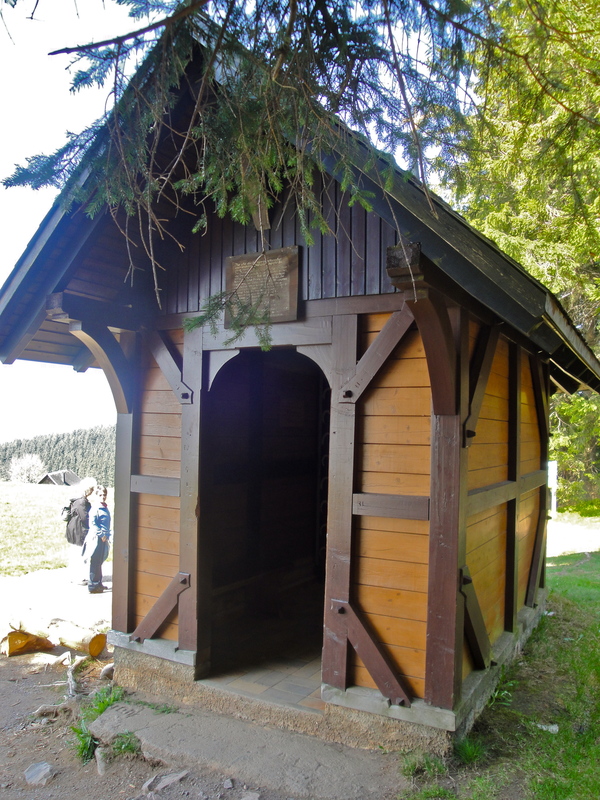 There were a couple little chapels along the way. They were pretty neat. There were also a lot of passive-aggressive trail signs. Very funny, German sign writers. 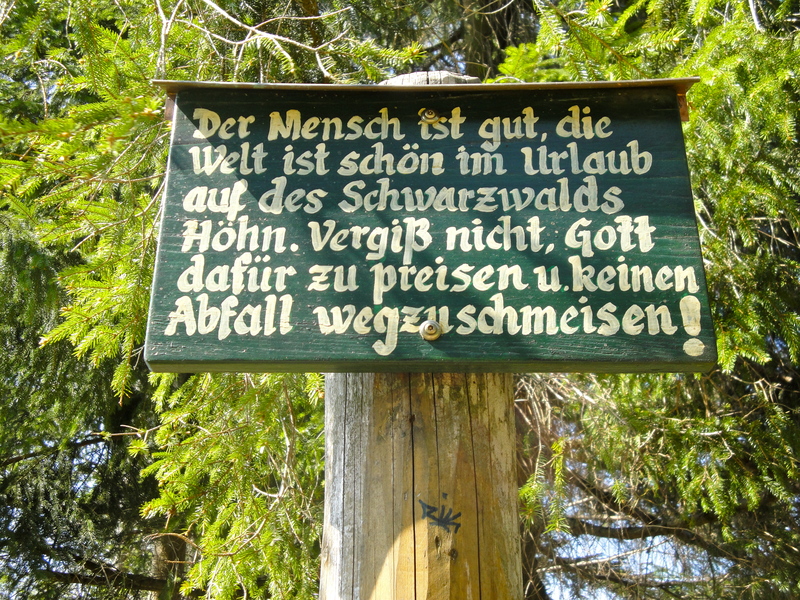 "Man is good and the world is beautiful on holiday in the hills of the Black Forest. Don't forget to praise God for them and to throw away your trash!" 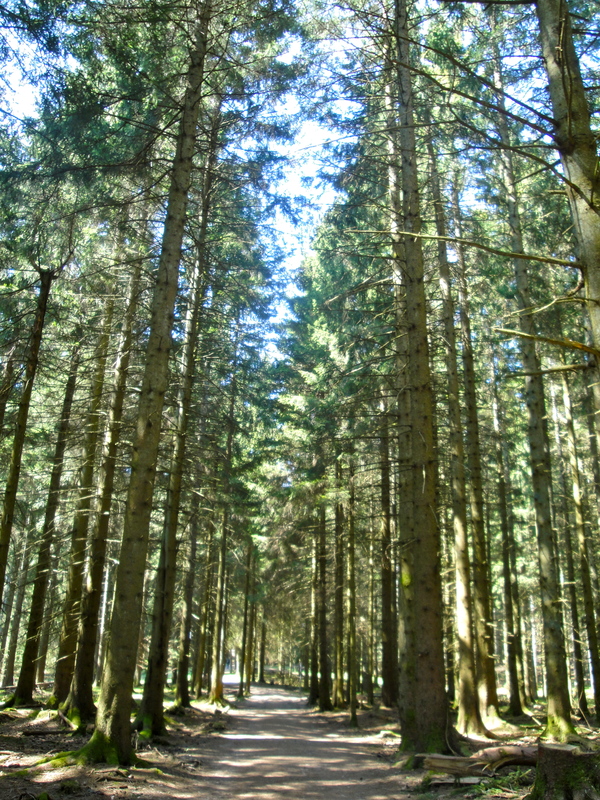 I determined that all forests, no matter where in the world they are, smell the same. And, to some extent, look the same. 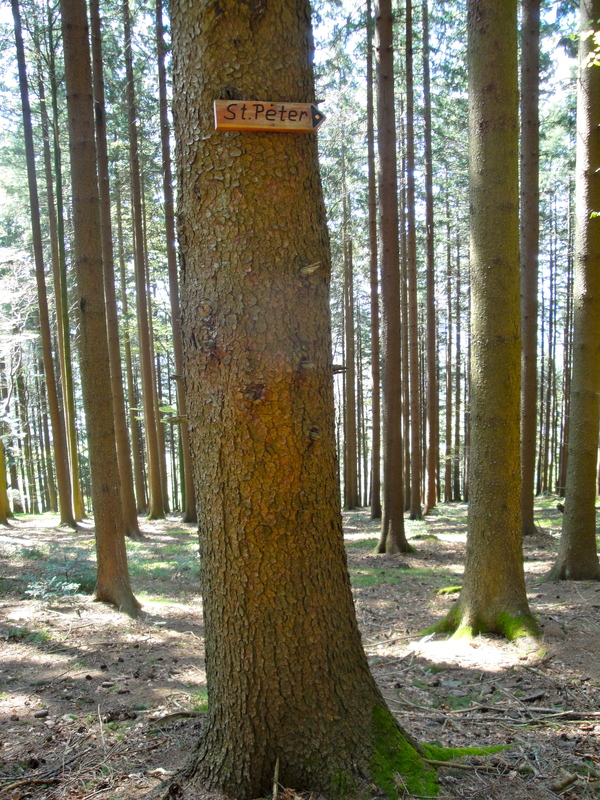 The Panoramaweg led me to St. Peter, another small monastery town. The inside of the church was beautiful! It was nice to have a chance to sit down after all that hiking. So there you go, friends. I apologize for the lack of deep thoughts, amusing childhood anecdotes, and romantic language. But really, if you use your imagination, this is almost as good. Random fact of the day: iTunes rounds up when determining song lengths! Who knew? Now you do! 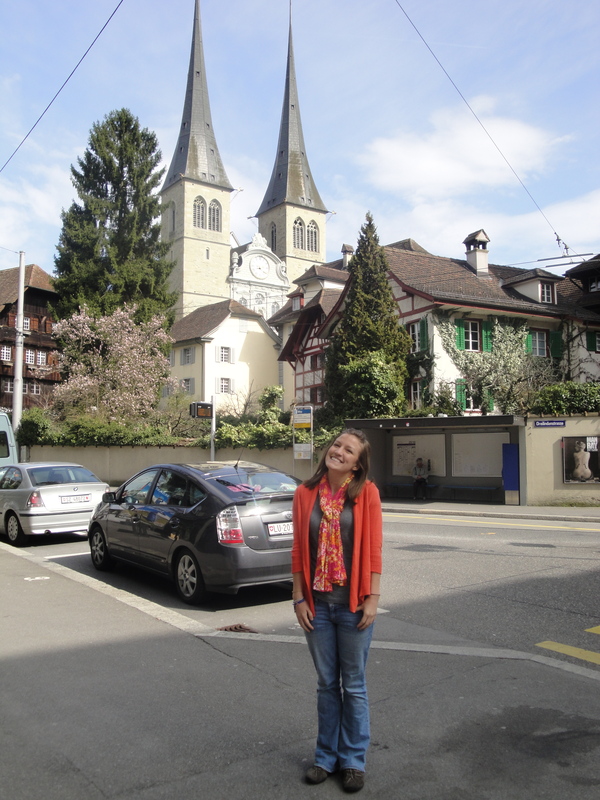 We’ve spent the past 2 days in Luzern, Switzerland. 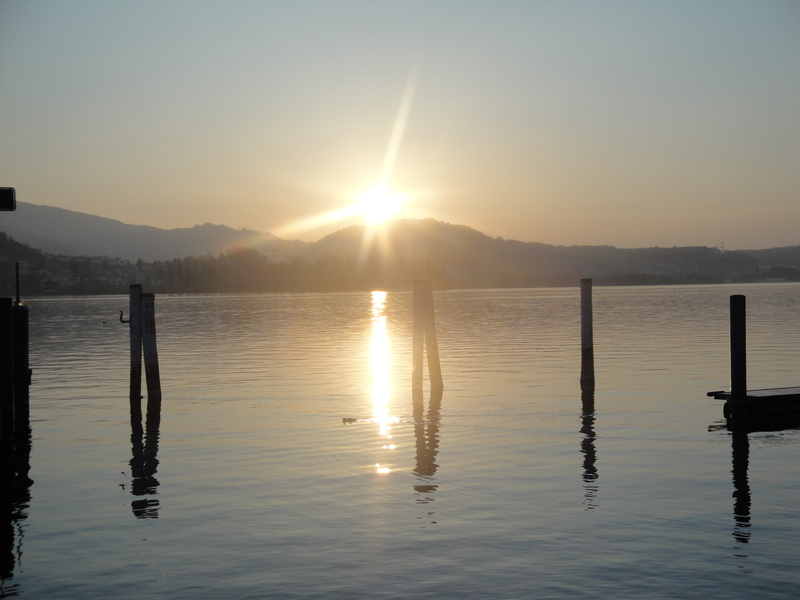 It’s a relatively-small city on Lake Luzern, and it is absolutely beautiful! Spring has almost sprung here (much to my relief… I was worried that I was leaving the sunny south to come to a frigid pre-spring Europe, but I was wrong!) so there are daffodils and green grass, but the mountaintops are still snow-capped. Here’s what we see outside our hotel window! We’ve ventured into downtown/old town Luzern both days, following a walking tour from a travel guidebook and kind of making up our own. It’s a really quaint and pretty city (at least the touristy part is)… one cool thing is the way that the history of the city is documented on its buildings. The Kapellbrücke (chapel bridge) is painted with placards of historical figures of Luzern and poems describing what is shown on them, and lots of the buildings and façades bear murals depicting what the buildings are/were used for. For example, in the Weinmarktplatz (wine market square) there is a mural of the Wedding at Cana! The main motifs of the city seem to be fountains (the water coming out of the fountains, just like all the water in Luzern, is extremely clean, so the people who live here apparently fill up their water bottles out of the fountains!) 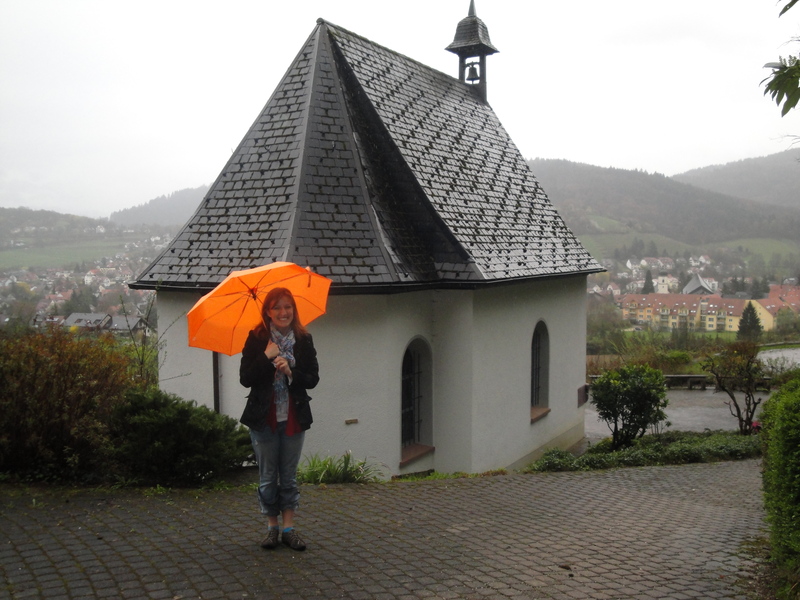 and churches (which are BEAUTIFUL!). 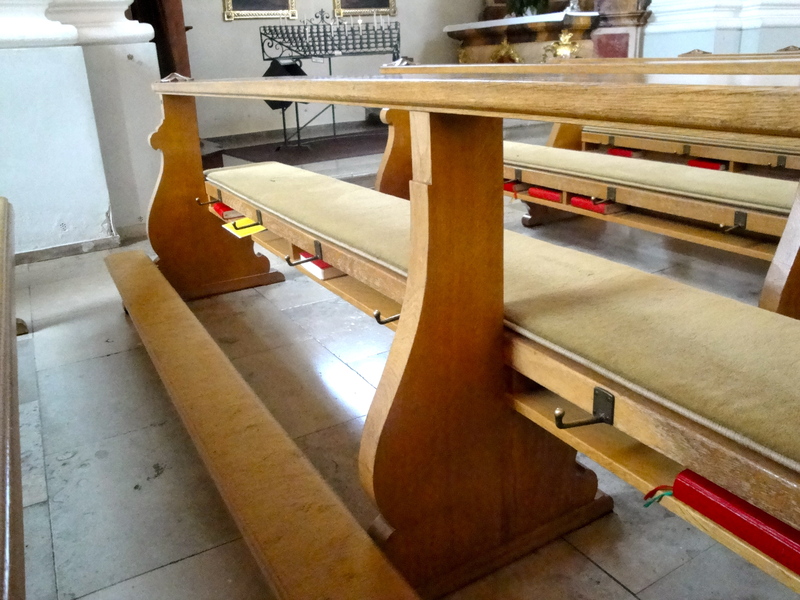 We saw the Jesuitekirche, Hofkirche (St. Leodegar), and Franziskanerkirche, three very different and distinct styles of churches despite their similar sizes. We laughed, of course, about the apparent frugality of the Jesuits and their artificial marble and mismatched furnishings. 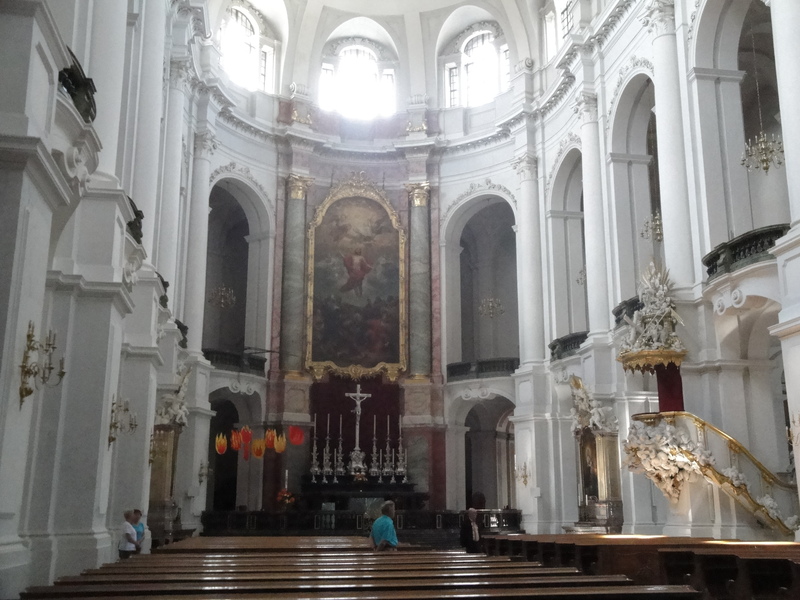 We were a bit disappointed when we stumbled upon the Franciscan church, because there was a symphonic and choral performance of some of Bach’s music… just ending. We walked in just in time to applaud for about five minutes. 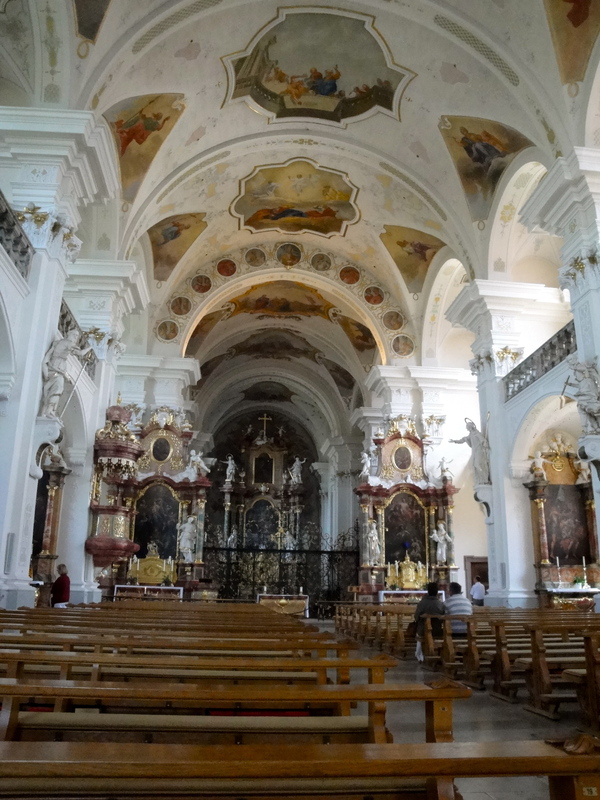 I really loved St. Leodegar… it was really delicately decorated with some apparently-very-well-known art.It was once only a monastery, but today it’s simultaneously a monastery and a parish. 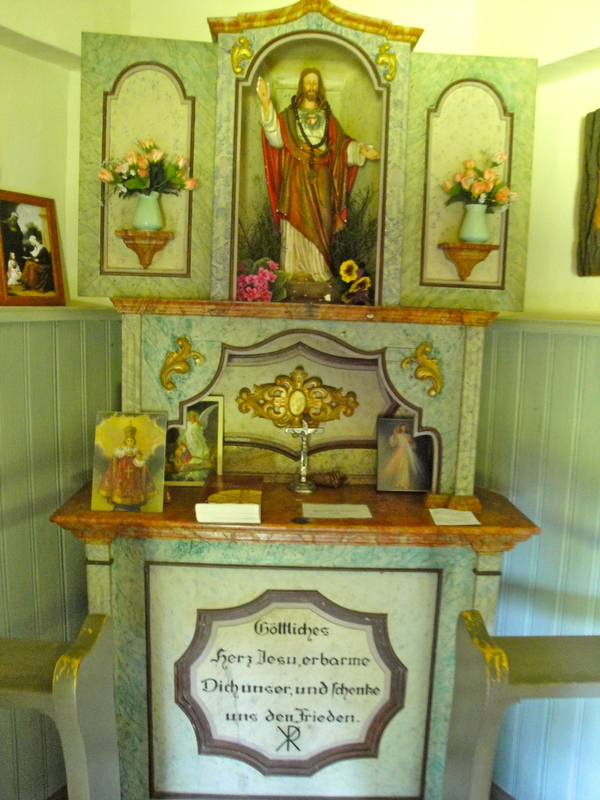 They also had Eucharistic adoration, so we went in for a few minutes. Always awesome! 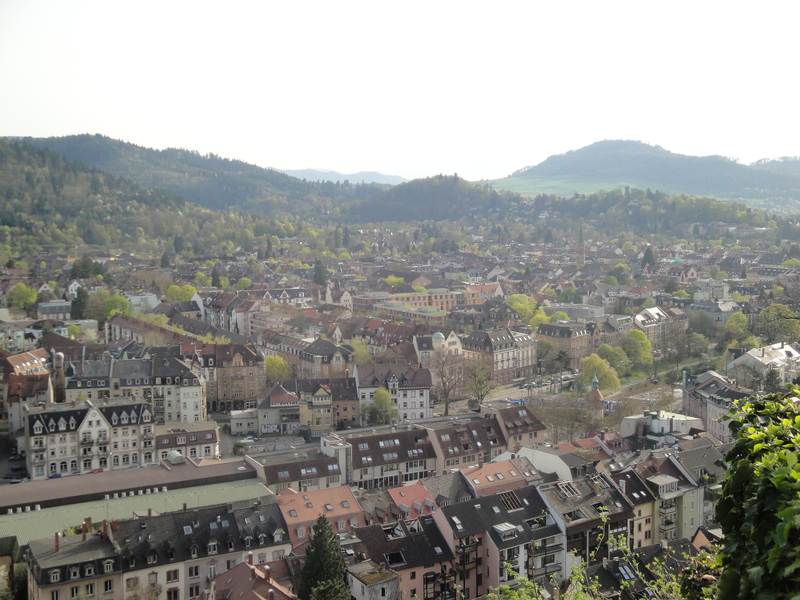 Our other adventure besides wandering the city was actual “wandern”… hiking! This is a huge pastime in Germany (in our case, the German-speaking world) and we had the fortune of staying in a hotel a mere 30 minute walk from a castle! So we took advantage. It was a great walk with fantastic views that led us to land that used to comprise a single estate, but now it’s owned by a bunch of different households of normal (extremely lucky) people who get to experience the glory of Lake Luzern, vineyards, and the Swiss Alps every day! 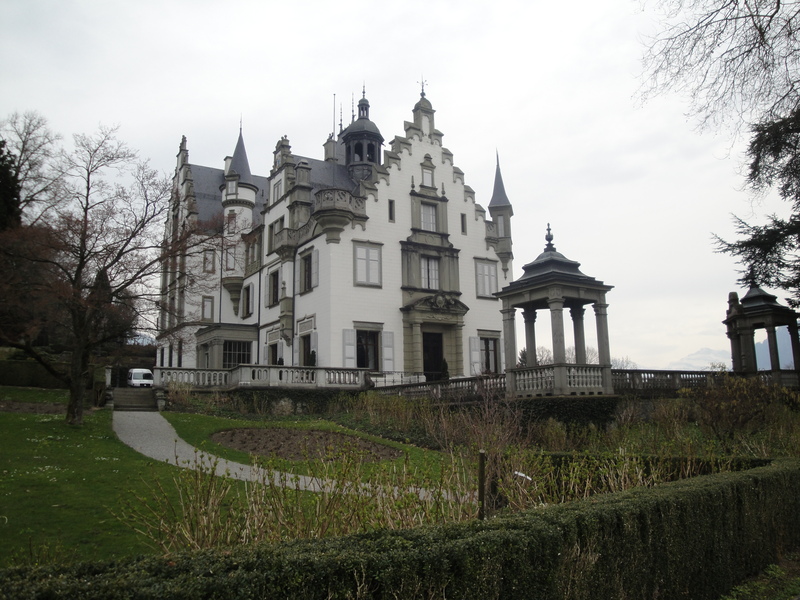 The castle was pretty–not what you’d think of when you hear “Schloss,” but it was like a beautiful old manor. On the land there was also a vineyard, a Christusstatue that looked a lot like Cristo Redentor, a chapel, some boathouses, and a dock. I may or may not have almost fallen into the water. We’ve basically exhausted all of the non-summer attractions in Luzern, so tomorrow we head to Bern en route to Colmar, France!